Up to 60 fuel cells are stacked in the Hexis fuel cell heating unit. Like adhesive plasters, TECs – which are already commercially available – are stuck to the walls of motors, industrial ovens and other heat sources. They consist of two different types of semiconducting materials on either side. If there is a temperature gradient between the two sides, electrons are transferred from one side to the other, i.e. an electric current is induced, which can be “harvested”. Under Heel’s leadership, Empa kicked-off the four-year “HITTEC” project this summer (HIgh Temperature ThermoElectric Converters). 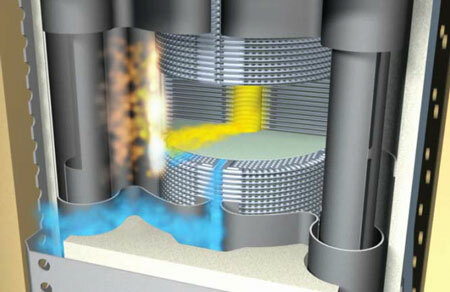 Its aim is to develop and optimize materials for TECs that can withstand elevated temperatures. Not a small feat, given that current TECs can only be operated at temperatures below 300 degrees. What’s more, HITTEC materials also have to combine seemingly contradicting properties. They should, for instance, be both highly electrically conductive and at the same have a poor thermal conductivity. A team led by Anke Weidenkaff, head of Empa’s Laboratory for Solid State Chemistry and Catalysis and professor of chemistry and biochemistry at the University of Berne, has set its sights on perovskite-type oxides. These compounds exhibit interesting properties: they are chemically and thermally stable, non-toxic, and can be produced at low cost in large volumes. A particularly promising candidate, it turned out, is tungsten-substituted calcium manganate. A thermal converter is blanketed on hot surfaces and can provide (extra) electric power. 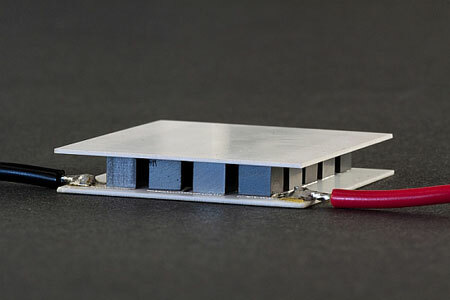 In order to properly evaluate the power output of their novel high-temperature thermoelectric converters at high temperatures, Weidenkaff's team has developed unique equipment capable of faithfully replicating the extreme operating conditions experienced by HITTEC modules. But the researchers are also developing new concepts to overcome challenges in the design of the HITTEC modules. “We are not simply going to stick our converter onto an SOFC”, says Weidenkaff. Instead, her team wants to integrate fuel cell and thermoelectric converters in an entirely new way, by directly using thermoelectric converters as fuel cell electrodes, that is, the site of the chemical reaction. “An ambitious idea”, admits Weidenkaff. But one with a huge potential because the high-temperature ceramic materials of the SOFC conductor system are not unlike perovskite-type oxides used for HITTECs. The project relies on a highly multidisciplinary team; Heel and Weidenkaff are cooperating with colleagues from ETH Zurich, EPF Lausanne and the Zurich University of Applied Science (ZHAW). The team’s combined efforts will lead to prototypes constructed together with Hexis. Heel estimates that SOFC systems could generate up to 10 per cent extra electric power by using thermoelectric converters – thus conserving a significant amount of valuable energy resources.